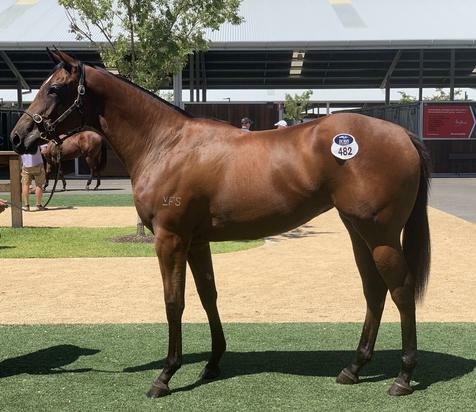 Outstanding filly purchased for $45,000 at Inglis Classic Sale 11/2/19. She is from the first crop of Press Statement, a dual Group 1 winning son of Hinchinbrook. From a 4 time Metro winning Magic Albert mare Magita. This filly is a 3/4 sister to Brook Magic and is from the family of Shamus Award. We have watched this filly grow from birth at Fairview Park Stud and are delighted for her to join our team. PRESS STATEMENT (AUS) (Bay 2012-Stud 2016). 6 wins-3 at 2-from 1100m to 1600m, A$1,832,275, MRC Caulfield Guineas, Gr.1, BRC JJ Atkins S., Gr.1, ATC Hobartville S., Gr.2, Stan Fox S., Gr.2, TAB Place Multi 2YO P., TAB Place Multi H., 2d ATC Randwick Guineas, Gr.1, Run to the Rose H., Gr.2, 3d ATC George Ryder S., Gr.1. Half-brother to SW Pressday (BRC TJ Smith Classic, Gr.1). Closely related to SW The Mighty Lions, etc. His oldest progeny are yearlings. Brook Magic (f. by Hinchinbrook). 4 wins-2 at 2-at 1000m, 1100m, A$237,085, to 2017-18, ATC Theraces H.-twice, 2d ATC TAB Rewards 2YO H., Forum H., Hyland Race Colours 2YO P., 3d ATC Book Spring Now Sprint H.
Pure Exceleration (g. by Excelebration). Placed at 3 in 2018-19 in Aust.